Meet Drchrono, the free app for your mobile device that could revolutionize healthcare in the modern world. Founded by Daniel Kivatinos and Michael Nusimow, Drchrono is a software platform that eliminates the need for paperwork, because it tracks everything digitally. Doctor’s notes, test results, symptoms – they all go into your electronic medical record (EMR), and can be pulled up anywhere (with your permission) no matter where your doctor or you may be. Available on most mobile platforms, including a doctor’s new best friend – the iPad, Drchrono lets you simply enter medical information on the same device you use to play Draw Something. 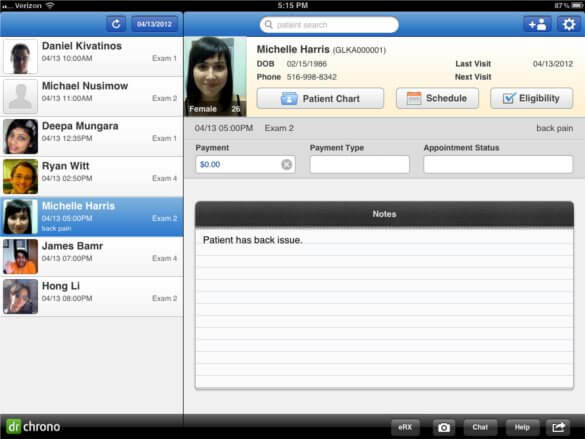 Besides filling out EMR, Drchrono lets doctors check insurance eligibility, take dictation, or even snap a few photos. Patients use it to enter their own data, leave questions for their doctor, and (eventually) to track their health. To date Drchrono has been downloaded by medical professionals more than 20,000 times for the iPad alone. Singularity Hub spoke with Daniel Kivatinos as part of the Membership Program’s regular Hangouts with tech VIPs. Kivatinos discussed the history, scope, and future of Drchrono, and highlights from that conversation are available in the video below. Not only is Drchrono digitizing the modern doctor’s office, it’s also the platform that could drastically improve healthcare by handling all the boring, administrative tasks automatically. Allowing you and your doctor to focus on what’s really important: getting you healthy again. As Kivatinos explains in the video, Drchrono’s whole aim is to change healthcare. Traditionally, doctors and nurse practitioners record patient information on paper files – files they have to store, send for, and modify by hand. With Drchrono, both medical staff and patients can input information digitally, and share that data quickly as needed. No matter where a patient travels their digital medical records can be updated efficiently – holding all the test results, doctor’s notes, and patient questions that it needs to be complete. The core features of the Drchrono platform, which are available for free, fulfill all the requirements for US doctors to earn Medicare incentives for adopting EMR in their practice. That’s why switching from paper files to Drchrono can earn doctors up to $44,000 from the government! The promise (and financial allure) of Electronic Medical Records is great, but Drchrono goes well beyond simply enabling EMR. Kivatinos wants to make access to patient records not only efficient but natural. Patients can be handed an iPad, take their own picture for records, and type in questions they want to ask their doctor. When doctors call up the file, all that information is right there in there hands. Doctors can add in notes by hand, or just by talking using medical speech to text (a pay feature for Drchrono). Before a procedure is prescribed, doctors can quickly check insurance eligibility through Drchrono in real time, and perhaps adjust treatment accordingly. The tablets are doing more everyday. Engineers in the Drchrono team receive input from hundreds of doctors and continually update their platform to meet new demands and improve the product’s use. That’s not the model for a medical company, that’s the model for a tech company, and it’s how Drchrono will continue rapidly evolving to keep up with the cutting edge of medical care. Already Kivatinos and his cofounder Michael Nusimow have the company expanding aggressively. A graduate of Ycombinator’s startup incubator, Drchrono raised $4.1 million in seed funding, and is actively looking for new personnel. Besides the constant improvements in their software, Drchrono will also look to increase its brand awareness, mostly from the ground up. The more doctors, nurse practitioners, and patients that Drchrono can attract, the closer they come to being adopted as the industry standard. Being free helps. With tens of thousands of dollars made available by adopting Drchrono’s free EMR features, the company can easily get its foot in the door. Then, monthly subscription fees for advanced features (speech to text, insurance eligibility, etc) offer value-adds while simultaneously generating great revenue. It’s a win-win situation for doctors and Drchrono. Patients have something to gain as well. With the rise of 24-hour medical monitors, online advocacy communities, and maps of environmental hazards, patients can collect more data than ever before on factors that may affect their health. Already Drchrono is able to take some patient input, and eventually all such patient data could be folded in. Not only will you be able to learn more about yourself, Drchrono will put that knowledge directly into the hands of the people who treat you. Occasionally Singularity Hub reviews a technology that is exciting because it is flashy, or because it represents some incredibly advanced concepts that may arise in the future. Drchrono is exciting for a different reason: it makes so much g*dd*mned sense. The adoption of EMR is a no-brainer, but Drchrono is so brilliant because it keeps adding in all the other great features needed for truly digital healthcare. 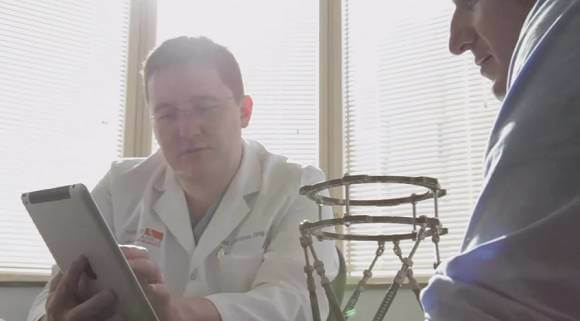 As Kivatinos explained in the video, Drchrono started just as scheduling software and continually expanded to include more and more desired features until doctors found it indispensable. It’s going to keep expanding, adding in geofencing, data collection, and more. Drchrono, or a platform very much like it, could eventually incorporate or serve as the data hub for all the great mobile medical technologies we discuss (medical advice from AI, cybernetic implants, genetic tests, etc). In other words, Drchrono is an idea that seems smart now and is only going to get smarter and smarter as healthcare evolves in the 21st Century.